I'm certain I've talked about my total adoration for leopard print before. I do have an affection for stripes. And I love a good polka dot. But there is an undying inferno that burns inside of me for a leopard printed piece of clothing, accessory or home décor. To me, leopard print is multi talented and does double duty by not only adding pizazz as a print, but also blends well as a neutral. 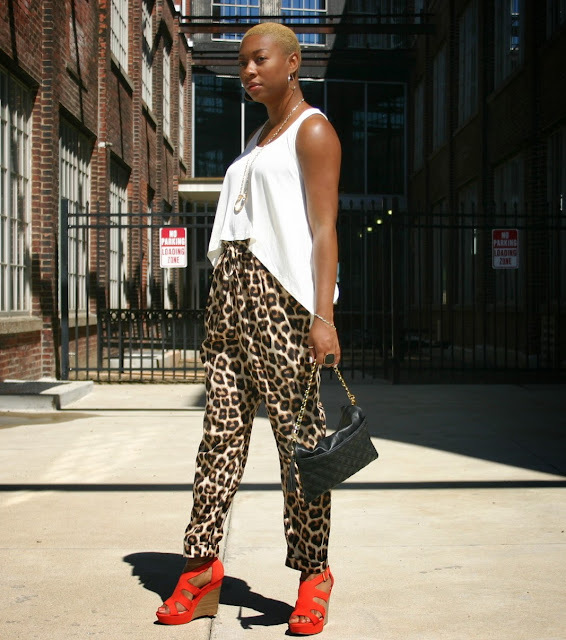 I rock leopard with basic black, white, vivid hues and as a great piece for print mixing. I was inspired to get these pants after seeing a pair of Zara pants that become ever so popular in the blogosphere. And I could see why, they gave me immediate heart palpitations! However, Zara happens to be nowhere in my immediate vicinity and they weren't available online, so I was pretty much out of luck. After a few weeks, who would you think would have a very similar pair. My good old friend, Forever 21. Fashion void filled. I'm not ashamed to say that I consider myself a bit of a leopard connoisseur. I'm very picky about how the print looks. Price doesn't play a part here (usually). Regardless of brand or designer, some leopard spots can just be flat or off in color - so be discerning! Because, darlings, leopard print done wrong screams cheap city....*side eye* and you don't want that. I also typically stick with the standard brownish tan leopard print, but occasionally I'll dip a toe in to a non-standard variation (like here and here). Next on my Diva's Desires list is a fab leopard coat for fall and a stunner of a leopard bag. Coincidentally, today's post is kind of like my favorite print - it's doing double duty. Not only is this post a part of this week's Style Me Friday Link Up hosted by The Fashionista Next Door, but it's also a part of IFB Project #107: Printed Matters. UPDATE: Here on Dazzling Diva I focus a lot on my career style, so I really enjoy when I get to post looks that I wear during my down time and after hours activities, which is why I've decided to also link this post to Mix and Match Fashion for the Summer Style challenge! Very nice look...ur pics are great!! Thank you, thank you, thank you!!! I definitely appreciate the love iCurvy!